Islam Around Us: Egypt military helicopters hit Sinai militants: Security. Egypt military helicopters hit Sinai militants: Security. Cairo | AFP | 13 Sep 2013 :: Egyptian military helicopters on Friday carried out air strikes on Islamist militant positions in Sinai, two days after suicide bombers killed six soldiers in the restive peninsula, security sources said. Apache helicopters targeted hideouts and vehicles used by the militants near the town of Sheikh Zuwayid in northern Sinai, the sources said. On Wednesday, two car bombs targeting the military intelligence headquarters in the town of Rafah and a nearby checkpoint killed six soldiers and the two militants who drove the vehicles. A little known jihadist group in Sinai claimed responsibility for the attacks in the town bordering the Gaza Strip. Jund al-Islam, or Islam’s Soldiers in English, made the claim in a statement posted on militant Islamist forums. 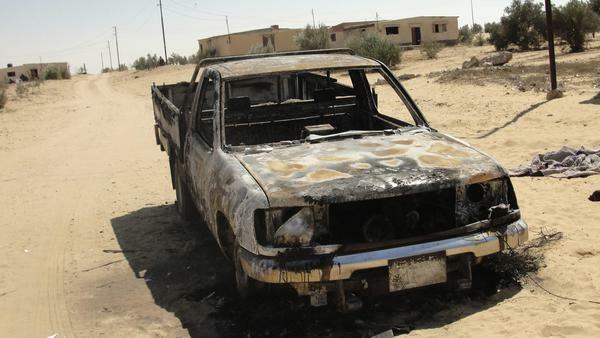 The group accused the Egyptian military of targeting “unarmed Muslims” in its campaign to quell an Islamist militant insurgency in north Sinai. The military has poured troops and armour into Sinai to crush the insurgency which surged after the army overthrew Egypt’s Islamist president Mohammad Mursi on July 3.